It is perhaps understandable why people in the ancient past once thought the Earth was the center of the solar system or that the Moon was made of green cheese. But believing that baby sheep grew on trees appears to have been really stretching it. Yet a lot of people, including noted scientists, actually believed that lambs grew on a special plant. And they held unto this belief almost as late as the time Columbus sailed for the Americas. To understand the strange confusion concerning the origin of sheep and the wool that Europeans used to make clothing we must look back into the history of sheep. It seems that sheep were first raised by primitive humans in Asia Minor, or Mesopotamia about 10,000 years ago. The animal eventually became known to the Persians, Greeks and Romans, who traded in wool and other goods like silk and spices that reached into Europe. Wool was especially popular because it could be spun and used to make very warm and comfortable clothing and blankets. But in the early days, traders traveled into the Middle Eastern countries and sometimes India to find it. They knew it came from sheep and that sheep bore little lambs, but their knowledge of animal husbandry apparently stopped there. There was a Greek named Megasthenes who first visited India and referred to seeing “trees on which wool grows.” He was obviously confusing a plant that produced seeds in a pod that resembled wood when it opened. But along came Fourteenth Century traveler Sir John Mandeville, who also traveled to India and returned to write about the Vegetable Lamb of Tartary, a tree from which little lambs dropped from the branches. Mandeville was obviously using a wild imagination to create such a story, but the idea caught on as a true scientific fact regarding the origin of sheep. For the next few centuries people throughout Europe actually believed that lambs grew out of the ground. The idea was so embedded in the minds of the people that noted botanists were still debating the story into the late 1700’s. After the Catholic Church began losing its grip on the minds of the people and the Renaissance began, people began challenging the fable of lambs dropping from trees. Girolamo Gardano of Italy noted in 1557 that the soil could not provide the proper heat for the embryos of lambs to survive. In spite of Gardano’s argument, several noted writers of his day poked fun at his notion, one even saying that he personally traveled to India to observe this strange animal-plant to prove its existence. 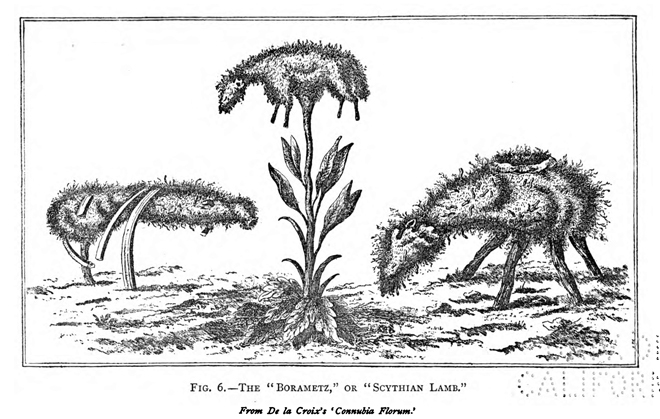 It wasn’t until the late 1600’s that Sir Hans Sloane presented the Royal Society of London with a fern from China, a fern rhizome, the Cibotium barometz, which had a stem that could be manipulated to look like an animal, that became the first real challenge to the concept of lamb trees. As it has been for nearly all of the ancient and seemingly crazy beliefs in things of our world, it took years of scientific study and written proofs before the people of Europe accepted the fact that sheep are mammals that breed and reproduce just like the rest of us. Of course the herdsmen who cared for the flocks throughout the Middle East clearly understood this and never once questioned their origin. But then, nobody from ancient Europe probably bothered to ask.